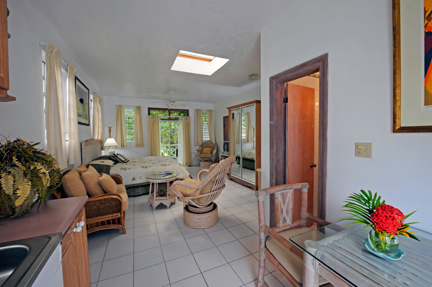 Description : This romantic suite overlooks our lush tropical garden and accommodates two people. The suite features a sky lit room with a fully equipped kitchen as well as a living and bathroom area. The atmosphere is perfect to escape, relax and forget about the hustle and bustle of the daily world. Guest will be surely enchanted with the light and breezy and environment this rooms offers.